Welcome to Found Off The Street, our new look at cars found on the cape that rust liked so much it decided to summer there; Cape Cod, MA. Today we have a 1955 Pontiac Chieftain. As you might remember from the junkyard story two weekends ago, I live on Cape Cod in Massachusetts. Not only is Cape Cod the cape that rust remembered but the amount of street parking is minimal at best. This makes for two obvious obstacles when it comes to Down on the Street material. That being said, old cars can be found anywhere, it just takes a little more looking around. Any unrestored rust-free 50s car is a rare beast up here in the Northeast. 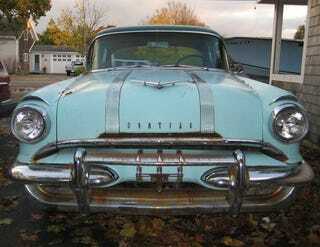 This 1955 Pontiac Chieftain is a particularly rust free and nice example. Befitting of its recent orphan car status, the Pontiac has been sitting outside a closed up gas station for a couple years. Despite this, the condition of the car clearly illustrates it hasn't been exposed to very many New England winters in its life. Obviously a well taken care of car that fell into a state of disrepair and moved outdoors not too long ago, there is nothing that a couple weekends and a little love for the 287.2 in "Strato-Streak" V8 couldn't fix. The Pontiac was listed on craigslist this spring and, in a move that I have regretted several times since, I did not call to find out more about the car. What information I took away from the craigslist ad was that the car did not run from an extended period of sitting and the owner had an "inflated" opinion of what the old four door was worth. I still go out of my way once every two weeks or so to make sure it's still there and it doesn't have a for sale sign with a slashed price on it calling my name.